On 8 March 2018, from 2 p.m. to 12 p.m., NEOMA Business School – Rouen Campus invites all international and French students to take part in the « Normandy for Peace » hackathon, supported by the Normandy Region. Attendees will have the opportunity to make a difference in the world by inventing practical solutions to promote peace in a region or a country. The winning projects will be presented during the World Peace Forum organised by the Normandy Region, which will take place from 6-9 June 2018 in Caen. A hackathon is a sprint-like event, during which students from many schools work together in teams to generate ideas about a chosen theme. After an inspiring time with professionals presenting examples of existing initiatives, coaches help students to outline their ideas before the final pitch. At the end of the event, a panel will award prizes for the best ideas: € 500 for the 1st winning project, unusual visits of Paris with www.wide-trip.com, places for Caen Memorial, and others surprises ! 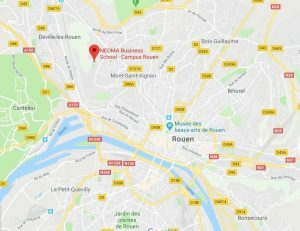 NEOMA Business School classée 2ème au baromètre de l'entrepreneuriat étudiant!